Note: if you would like to get quick four minute overview of the key GhostDoc features before proceeding with the evaluation guide below, you can view this video. Once you've downloaded and installed GhostDoc Pro, you can access its features in several ways. 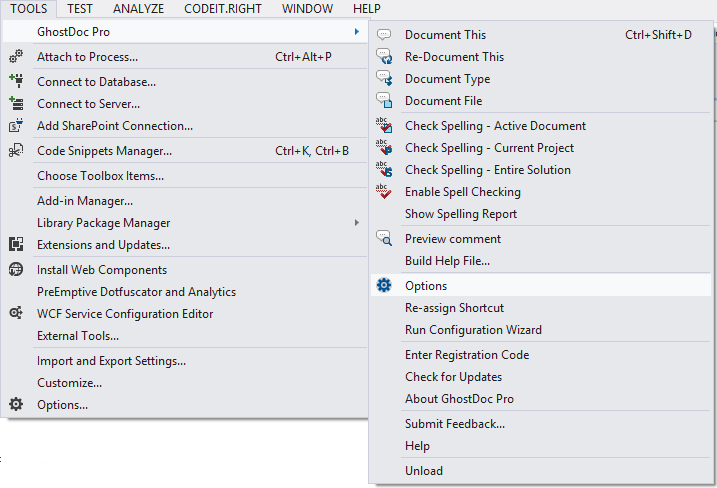 And, as you'll see as the tutorial progresses, right-clicking inside a code file in the Code window of Visual Studio brings up a context menu of available GhostDoc Pro options. Although GhostDoc Pro offers much more than this, these are the features you'll most often use and are the ones where we believe GhostDoc Pro saves you the most effort. You can create an initial set of XML comments in several ways. Left-click on the code item for which you want to create comments. Then, use the Ctrl+Shift+D hotkey combination to create the comment. Left-click on the code item for which you want to create comments. Then, click on the first button in the GhostDoc Pro toolbar. Finally, select the Document This menu item. (See screenshot below). Right-click on the code item where you want to create comments. 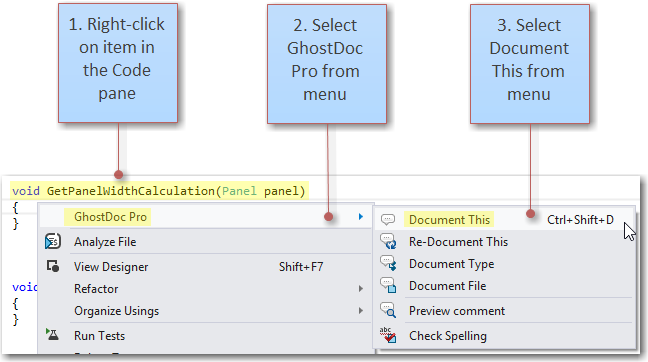 Then, select GhostDoc Pro --> Document This from the context menu that appears. Avoid non-standard abbreviations â€“ ReadXmlFile is OK; ClrMinVals is not. This Ghost Doc Pro feature (not available in the free version) lets you instantly update an existing XML comment if you've made a change to the code that will affect the comment. In the simple example below, the original method name has been changed from GetPanelMeasurement to GetPanelMeasurements. When the Re-Document This feature is implemented, the summary element of the comment is automatically amended to reflect this change. Although best practice is to have only a single class in a code file, there may be times when you have to use code that doesn't follow this practice. In those cases, you can create comments for just one of the classes (GhostDoc Pro only). This is done by using the Document Type feature. 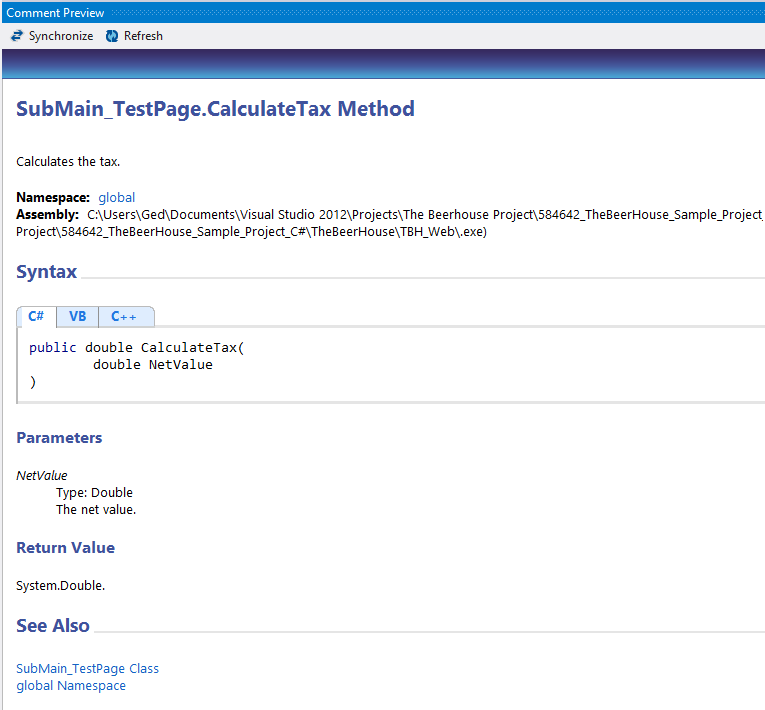 To implement this feature, you select the code to be commented in one of the ways described above, and then select the Document Type menu item. If you want to document the whole file in one pass, (only available in GhostDoc Pro), you select the Document File option from any of the three GhostDoc Pro menus described earlier. 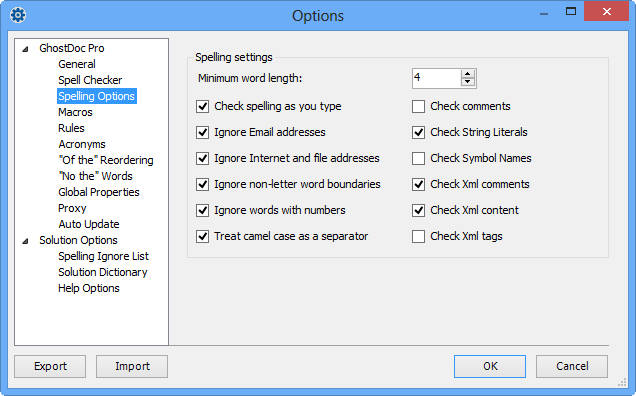 GhostDoc Pro includes an intelligent spelling checker. 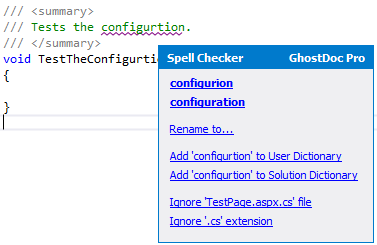 You can enable the Spelling Checker feature either from the Tools --> GhostDoc Pro --> Enable Spell Checking option in Visual Studio, or by clicking the Enable Spell Checking option in the GhostDoc Pro toolbar (3rd button from the left). Although using this Toolbar button is the easiest way to turn spell checking on or off, you do also have the option of using the GhostDoc main menu button, or right-clicking in the code pane and using the context menu. 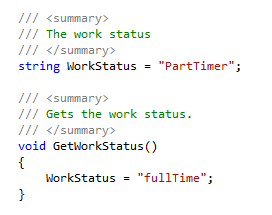 As soon as you activate this feature, real time spell checking will start and the current code page will be checked. Any potential spelling errors will be highlighted with a wavy line underneath the word. Add the highlighted word to a dictionary for this Solution only. 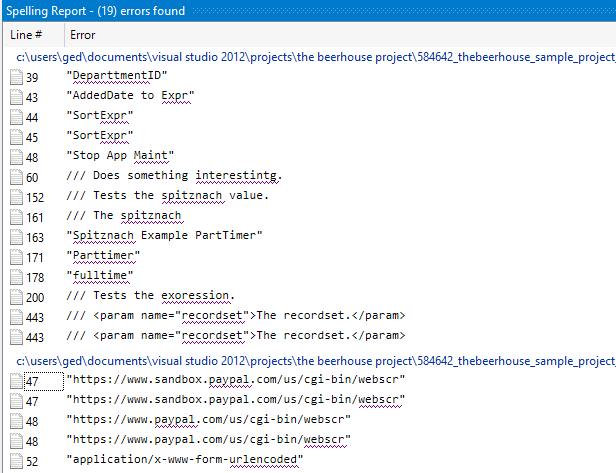 Stop spell checking this file and ignore any future errors in the file. 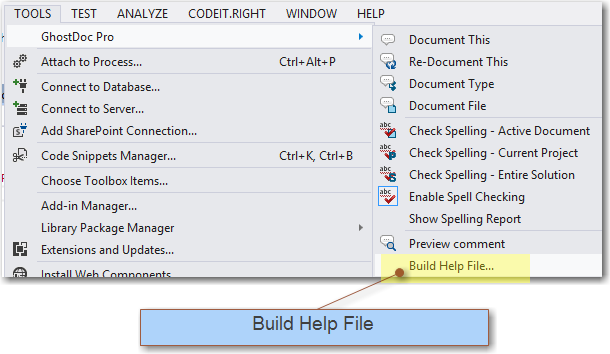 Stop spell checking any file in the solution that has the same file extension. 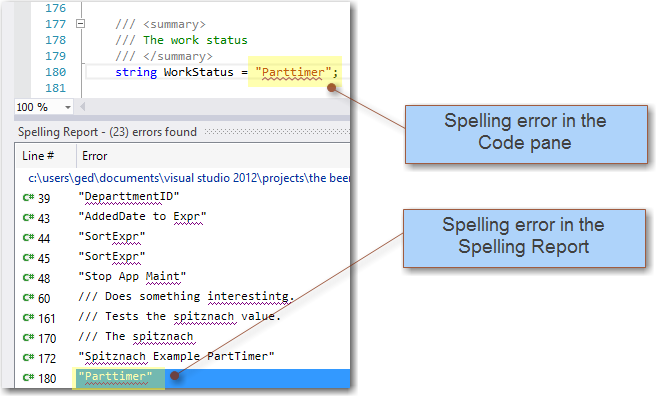 Ghost Doc Pro gives you very detailed control over what is spell checked and what is ignored. To change the default settings, select Toolsâ€”>GhostDoc Proâ€”>Options. Symbol names â€“ i.e. Method names, Class members, etc. One particularly smart feature in the GhostDoc Pro Spell Checker is thee way it will split amalgamated words into their individual parts and check each part. 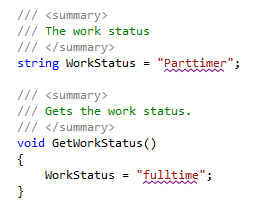 In the following example, the words PartTimer and fullTime are both allowed because GhostDoc Pro has split them into â€˜Part' and â€˜Timer', and â€˜full' and â€˜Time' respectively, and all four of those words are spelled correctly. As I mentioned previously, if you follow the guidelines for naming, this will greatly help you to create readable, understandable code that can be effectively commented and spell checked by GhostDoc. 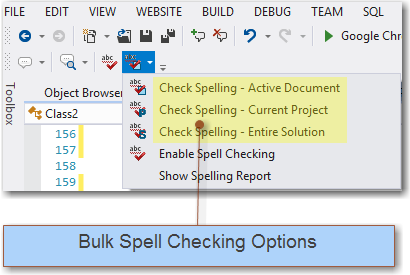 There are three options for bulk spell checking â€“ Active Document, Current Project, and Entire Solution. 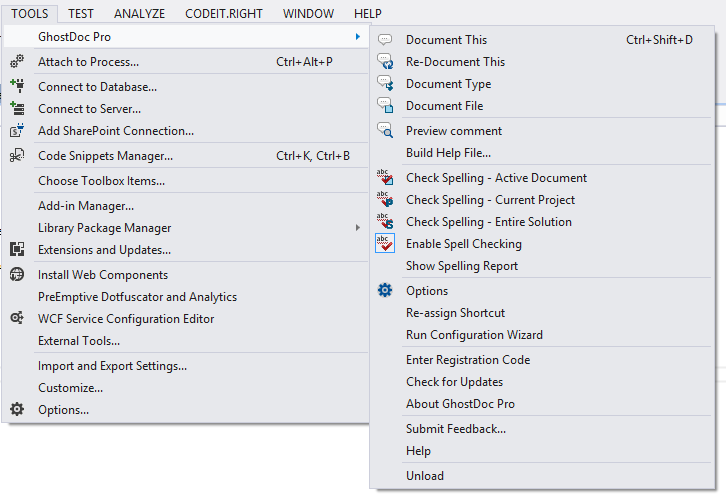 If you want to spell check the active document, the quickest way is to click on the Check Spelling â€“ Active Document button on the GhostDoc Pro toolbar (4th icon from the right). All three options can be easily accessed by clicking the down arrow to the right of that button. 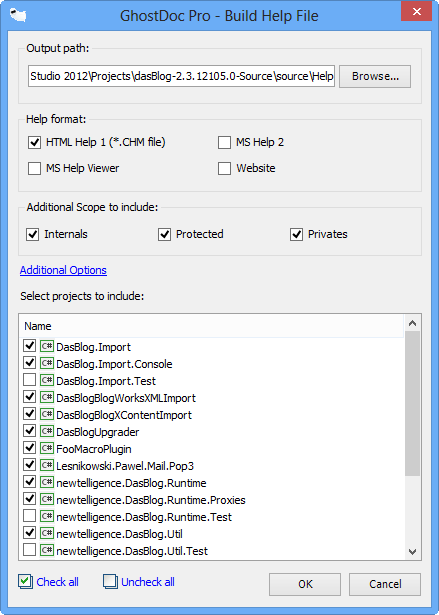 They can also be accessed from the Tools --> GhostDoc Pro menu in the Visual Studio IDE. This report displays the individual items picked up by the spell checker, grouped by file name, and listed with their line number in the code file. You can edit the misspelt word in the code window as shown earlier, and you can also make the change in the Spelling Report. To do this, right-click on the item in the Spelling Report and when the error correction dialog appears, make the change you require. You will have the same list of options that you saw earlier. Any change you make will immediately be reflected in the code and that error will disappear from the list of errors in the Spelling Report. 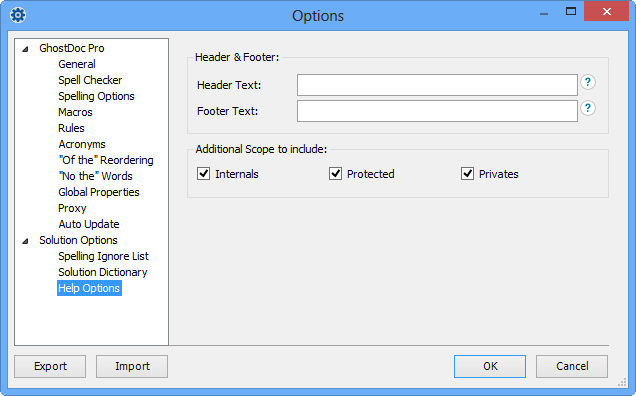 This option is available from the GhostDoc Pro toolbar or from the Tools --> GhostDoc Pro menu. When you select this option, a Spelling Report based on your most recent option selection will be displayed. 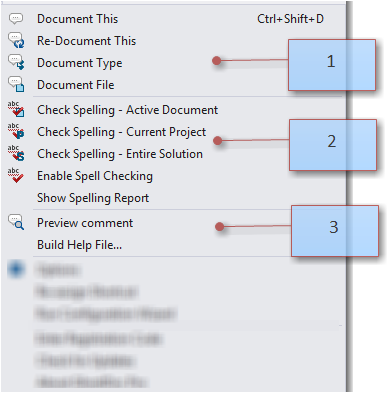 That is, if you last selected the Check Spelling â€“ Current Project option, the report will include all relevant files in the project. If your last selection was one of the other two options, the report will include the active document only or every relevant file in the solution, respectively. 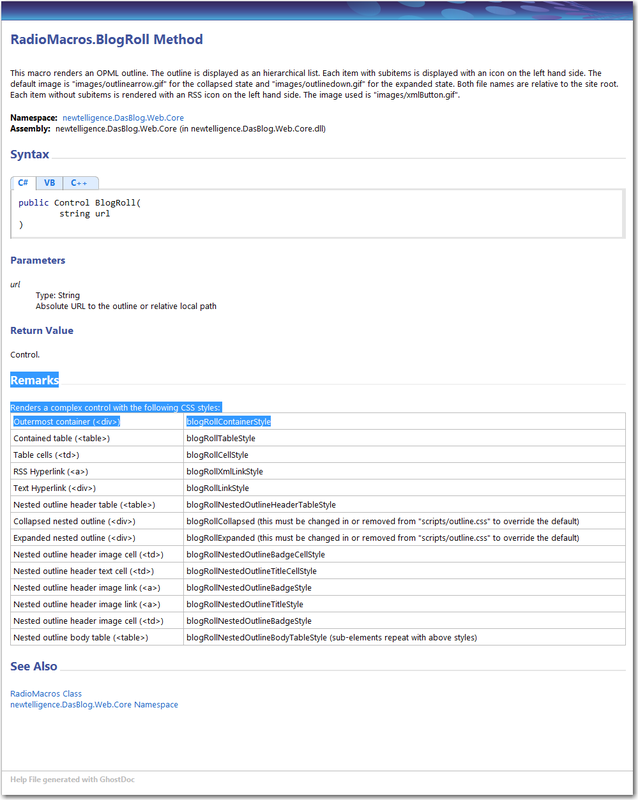 You can see what an individual XML comment will look like after it's been built as a page in a help file by selecting the Preview Comment feature from the main menu, the context menu or the GhostDoc Pro toolbar (second button from the left â€“ circled in the screenshot below). 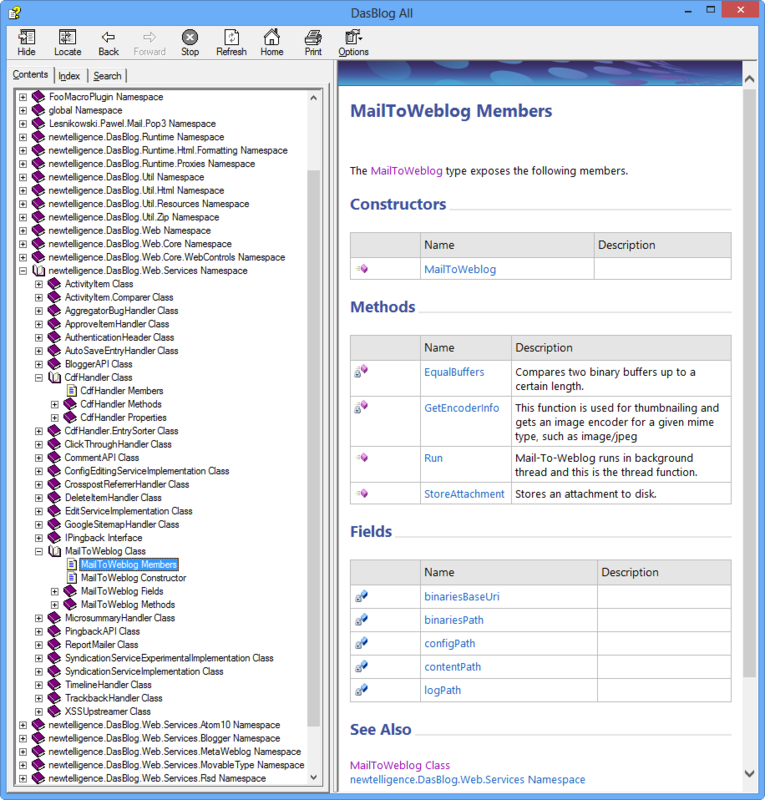 Alternatively, you can access it from the Tools â€“->GhostDoc Pro menu in the Visual Studio IDE. You can also select the Additional Options link and choose to include header and/or footer text in the help pages. This introductory article only covers the features of GhostDoc Pro that you'll likely use most often. There are many more than those covered here. 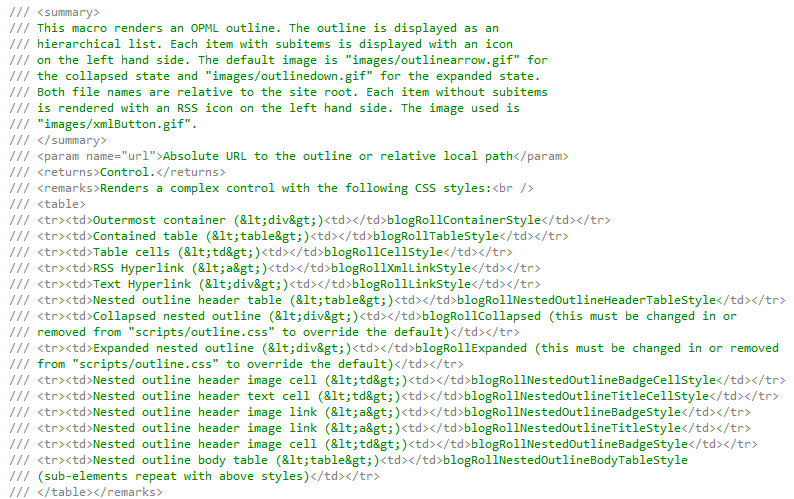 The core functions that document XML comments and the Ctrl-Shift-D hot keys are what GhostDoc is most famous for. But the additional features of the very smart spell check utility, together with comment preview and Help file building, make GhostDoc Pro a utility that's much more than a plain old comment creator. I hope that this article will help you see what an invaluable tool GhostDoc Pro can be and that it'll encourage you to download the free trial and try out its features for yourself. We're confident that it will quickly make you more productive and within a very short time of using it, will find GhostDoc Pro to have been one of your better decisions.